In order to facilitate moving around the website we have prepared a User Guide to the SeeTheStats website. 1.2. Is SeeTheStats a safe service? 1.3. What does SeeTheStats offer, which is different from other websites of this kind? 1.4. What do I gain by registration and how much does it cost? 2.1. What are the webstats displayed on SeeTheStats and how are they generated? 2.2. Why are the webstats of some websites available and others not? 2.3. Why do some statistics look different than in Google Analytics? 2.4. Why do I have days with zero visits? Is your import process really reliable? 2.5. I have not found webstats of a website I am interested in. What can I do? 3.1. What can I set or change on "My webstat pages"? 3.2. How can I add new statistics or delete old ones? 3.3. Why do I have to log into Google Analytics when editing my website profile? 3.4. How many statistics of a given website can I display? 3.5. Can I create separate profiles of statistics for different pages of the same website? 3.6. Can I hide some of the statistics in order to show them only to selected persons? 4.1. What is a widget and what does it do? 4.2. How to configure a widget? 4.3. How do I place widgets on my website? 5.2. How to configure counters? 6.1. Is it possible that my personal details will be visible to third parties? 6.2. Is it possible that my personal details will be passed on to the third parties? 6.3. Is it possible that third parties will be able to check the statistics other than the ones I have made available? 6.4. Is it possible to restrict the display of my statistics to a selected group of people? 6.5. How does SeeTheStats import my data from Google Analytics? 6.6. In what way can I block SeeTheStats from accessing my statistics on Google Analytics? 7.1. Is SeeTheStats involved in creating tools for collecting webstats of websites? 7.2. Where will I find the rules of using SeeTheStats? 7.3. If I have a question, suggestion, idea or problem, what can I do with it? 3.2. How can I add new statistics or delete existing ones? 3.5. Can I create separate profiles of statistics for different webpages of the same domain? 6.6. How can I block SeeTheStats from accessing my data on Google Analytics? 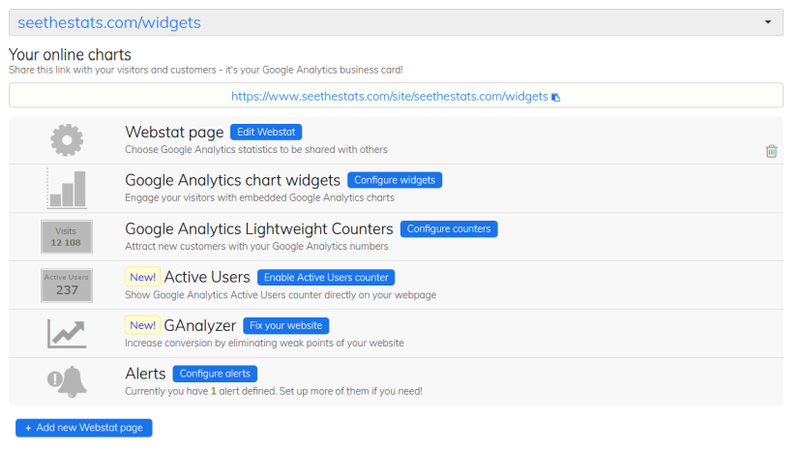 7.1 Is SeeTheStats involved in creating tools for collecting webstats of websites? 7.2 Where will I find the rules of using SeeTheStats? 7.3 If I have a question, suggestion, idea or problem, what can I do with it?